It’s an eating challenge! Click here to play! You’ll need to take center stage to start gobbling down as much food as possible in this eating contest. The more you swallow, the more you win, so get your knife and fork ready! There is literally a buffet at the tip of your fingers with plenty of tasty entrees to choose from. Start off with the dinner symbol. This plate is piled high with plenty of tasty treats, and it’s a substitute. It will replace most other symbols to help you spin in more wins. Next up, conquer the ham. This roasted meat is worth up to 6,000 coins if you can gather two or more across an active payline. You’ll follow it up with a course of lobster as the crustacean is worth up to 3,000 coins if you can gather two to five of them across an active payline. There are also cakes and antipasto plates to be munched on for a chance to bring in very generous payouts. 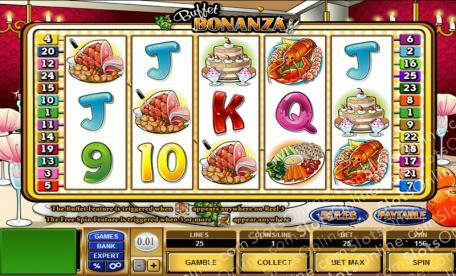 Be sure to keep your eye on the Buffet Bonanza logo while you’re spinning these reels as this is a scatter symbol. It will multiply your total bet as well as trigger a number of free spins to aid you in your quest for cash. So, grab a utensil and start shoveling as much food as possible down your gullet for a chance to bring in plenty of big money wins! The Buffet Bonanza logo is a scatter. Spin two to five of these symbols anywhere on the board to multiply your total bet by 2, 5, 20, or 200 respectively. Three or more anywhere on the board will trigger up to 10 free spins. The diner symbol is a substitute. It will replace most others, excludes scatters, to help you create more winning combinations. If it appears anywhere on reel 3, it will expand to cover the entire reel. The reels will respin with certain symbols being replaced with even more wilds.